"Blue Safety Top Stub Personal Checks" product is already in your cart. 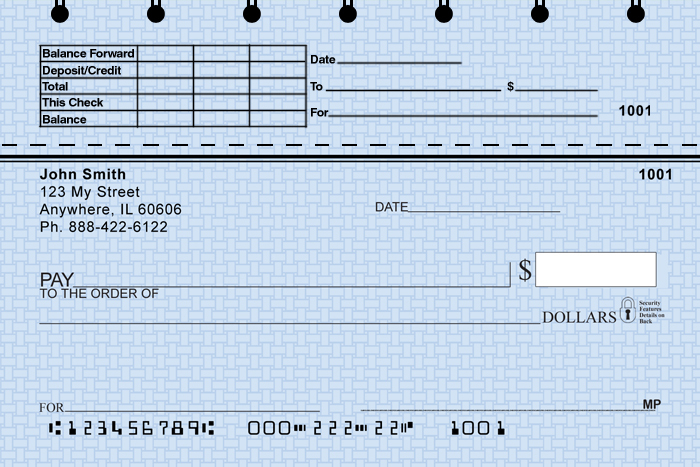 Our value-priced personal check line features eco-friendly and inexpensive Blue Safety Top Stub Personal Checks. They are the same high quality check that are guaranteed to be compatible with your bank or financial institution, and can also be personalized for your personal or business use. You can order deposit slips and extra check registers to accompany your Blue Safety checks, too. Matching address label and checkbook cover designs are also available.